2015 marks two decades of very productive research and industrial collaboration for City’s Centre for Compressor Technology. Established in 1995 by Professor Ian Smith and Professor Nikola Stosic, the Centre for Positive Displacement Compressor Technology made a great contribution to improving on and extending the range of applications for screw compressors. 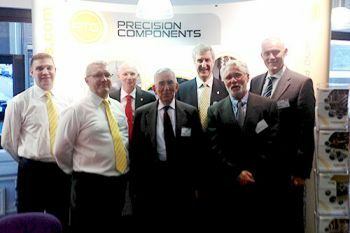 Now an internationally recognised centre of excellence, it was recently renamed the Centre for Compressor Technology with the aim of extending the scope to the development of all types of expanders and compressors. Professor Smith worked for many years on systems for the recovery of power from low grade heat. Owing to the war in former Yugoslavia, Professor Nikola Stosic joined City University as an expert in screw compressors from the University of Sarajevo. In 1995, he was appointed a Royal Academy of Engineering (RAEng) Chair with the industrial co-sponsorship of engineering firm, Holroyd. RAEng and Holroyd, were, in fact, foundational to the first decade of the Centre’s existence. 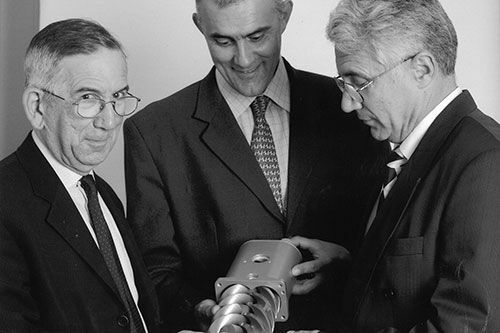 Professor Ahmed Kovacevic (Howden Chair in Engineering Design and Compressor Technology), who had been working on screw compressors since 1986, joined Professors Smith and Stosic in 1996, pioneering the application of Computational Fluid Dynamics (CFD) in the evaluation of screw machine performance. Latterly, they were joined by a number of researchers including Dr Elvedin Mujic and Dr Ashvin Dhunput who both currently hold senior positions in compressor industry. More recently, Dr Matthew Read, Dr Sham Rane and Dr Sumsun Naher have entered the Centre’s fold and are rapidly making contributions to the Centre’s excellence in research. The Centre has arguably been one of the most successful at City for establishing and sustaining industrial collaboration. Based on early work on the mathematical modelling of gears, Professor Stosic developed and patented a new type of rotor profile (the “N” rotor profile) in 1986, which was fundamentally superior to existing types in a number of ways. This led to its extensive use in industry. The screw technology produced at the Centre is currently used in no less than 20 countries around the world. Under the leadership of Professor Kovacevic, Howden Compressors Limited (HCL) established a Research & Development (R&D) department in 2008, utilising the methodologies and research capabilities established at the Centre. Since 2009, a series of R&D projects have been started with the company investing more than 10 percent of its turnover in R&D. Commercialising these projects enabled the company to almost triple its turnover from 2010-13 and increase employment significantly. This allowed the company to secure a major coal-bed methane (CBM) contract in Australia in 2013 - the single largest contract in its history which has led to repeated success with a similar project in early 2015. Following decades of research into the utilisation of waste heat using expanders carried out by Professor Smith, Kilbride-based Heliex Power, spun out of the Centre in 2009, is on course to being a global leader in steam screw expanders and their applications in the recovery of energy from industrial processes. Heliex’s core technology is a novel rotary screw expander which recovers low grade energy from steam and uses it to generate electricity. Alongside the companies mentioned above, the Centre has enjoyed a long and effective partnership with many compressor manufacturers including ELGI Equipment Ltd.
City’s Centre for Compressor Technology organises and hosts a biennial International Conference on Compressors and their Systems. This year, the 9th such conference in the series takes place from 5thto 9th September 2015. This conference is a leading forum for academic, research and industrial organisations concerned with the development of fluid machinery. One feature of the conference is a series of short courses tailored for industry, this year focussing on Computational Fluid Dynamics (CFD) in Positive Displacement Machines. Academics and students from the Centre have a high-profile presence in other international fora such as Purdue University’s International Compressor Engineering Conference and Germany’s Schraubenmachinen conference, winning major awards and recognitions. During the 2012 Purdue Conference, Sham Rane, received Second Prize for his paper on CFD analysis of screw machines. At the 2014 conference, PhD Mechanical Engineering student, David Buckney (now a rotor design engineer at HCL), won Second Prize for a paper related to the analysis of leakage flows in screw compressors. The Centre’s most prestigious accolade was the 2005 James Clayton Prize from the Institute of Mechanical Engineering (IMechE) awarded to Professors Smith and Stosic for their outstanding joint contribution to the application of twin screw machines to the compressed air, refrigeration and power generation industries. Mainly funded by industrial contracts, but with some public funding, members of the Centre have developed software for the improved analysis and modelling of both compression and expansion processes, the use of computational fluid dynamics, noise reduction and test facilities for both air and refrigerant screw compressors and expanders. This has facilitated the Centre’s ability to investigate and solve industrial problems, offer courses in machine design to registered students and industrial engineers, license proprietary software, and, if required, carry out the complete design, build and testing of prototype machines for industry. Centre members have been granted 12 patents, published three monographs, 85 journal papers, 166 conference publications and over 200 industrial reports, for which they have received 13 professional awards and prizes. The Centre will celebrate its 20th year at a fitting ceremony on Sunday 6th September 2015 at City during the 9thInternational Conference on Compressors and their Systems. Positive Displacement Compressors draw in and capture a volume of air in a chamber, then reduce the volume of the chamber to compress the air. 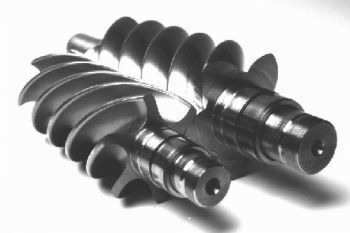 Reciprocating Piston Compressors, Rotary Screw Compressors, Rotary Vane Compressors and Scroll Compressors are all examples of Positive Displacement Compressors.